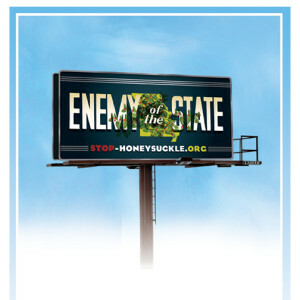 You can find stop-honeysuckle.org billboards on I-70 between St. Louis and Columbia on the north side facing east near the Danville exit, and on the north side of Highway 100 facing west just outside of Washington. Bush honeysuckle is a serious threat to Missouri landowners. Originally planted in urban areas, it is spreading to the Missouri countryside and strangling native plants and trees. This plant kills all other plants and wildflowers AND limits physical access to your property. Please become familiar with this threat to our Missouri countryside and take action to stop it from reaching your property. Preventing bush honeysuckle from infesting your farm or woodlands is one of the best investments a landowner can make. To learn how to rid your land of this invasive bush honeysuckle, click here. Magnificent Missouri organizes fundraising events in the greater St. Louis area to benefit conservation and environmental groups throughout Missouri.